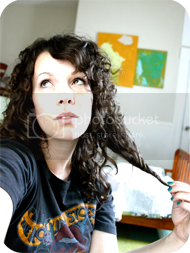 This week's Vintage Mama is Whitney of Little Reader Vintage. She's got an adorable daughter and a way of mixing vintage with modern that makes it look so easy. I'm on the hunt for some shoes like hers! A: I had some vintage clothing in high school, most of which were just awesome things I found in my mom's closet. (Specifically: a Mickey Mouse shirt which she got on her honeymoon, and a ringer tee from a furniture company in Portland where she used to work.) I think I originally started digging through my mom's old stuff because I'd spent my monthly allowance and I wanted new clothes. But it ended up being so much fun, I started going to thrift stores and vintage shops around Portland to find more. I'm wearing:vintage plaid shirt, thrifted. pants, f21. vintage leather shoes, thrifted. vintage leather purse, thrifted. earrings, upper metal class on etsy. A: I pretty much already have all the 'basic pieces' in my wardrobe, so when I shop for myself I look for accessories. This is my favorite way to integrate vintage into my wardrobe - through items like shoes, scarves, jewelry and bags. I just try to add a few pieces into the mix here and there. My "guilty pleasure" is looking for button ups and plaid shirts. 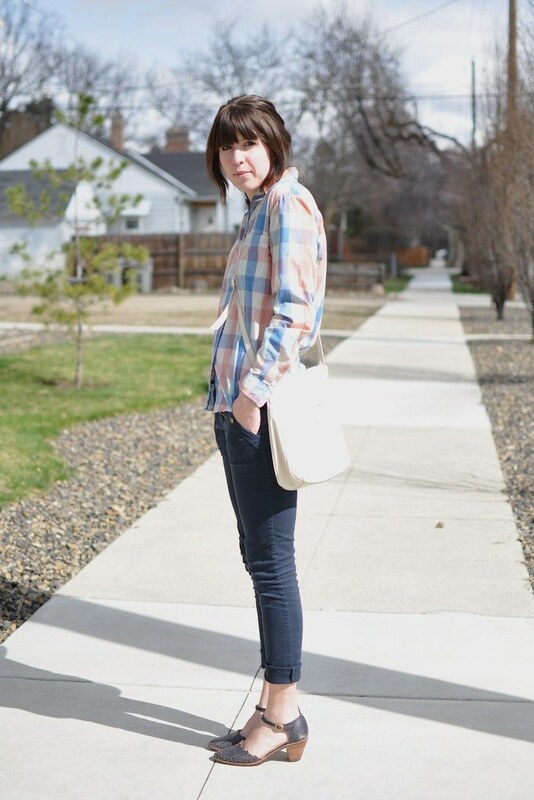 My overall style is pretty casual - I could wear jeans and a vintage plaid shirt everyday. (I usually find the best shirts in the little boys department!) No matter who I'm shopping for, I really try to find pieces that have a timeless style. I also try to make sure I only buy things that I think will actually last for a long time - no one wants something that will fall apart after the first wash or wear. Tayvee's wearing: vintage hand knit sweater, thrifted. leggings, baby gap. shoes, found by grandma. A: I really love my vintage shoe collection. Shoes are something I go through quite often; I am constantly donating old ones so I can make room for any new ones I find. There's only so much room in the closet! I just recently found the ones I'm wearing in the photos (for $4!) and they are my favorite shoes right now. But, my most cherished vintage possession is my wedding ring set which I inherited from my great-grandmother. I love that my husband gave it to me, and I love how it is so unique - I've never seen anyone with something similar. Tayvee's wearing: vintage white peter pan collar shirt, thrifted. 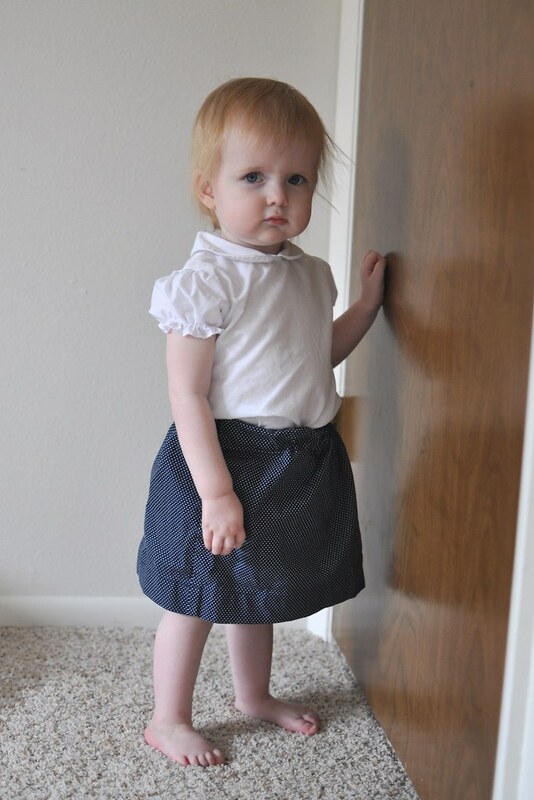 navy polka dot skirt, made by whitney. A: I am the person in thrift stores that will carry things around forever trying to decide if I should buy them. Usually I'm pretty good at knowing what I don't need, but I do have a list of memorable items (mostly boots) in my head that I wish I would have bought, but chose not to because I either had something similar or it was the wrong season. This is part of the reason why I opened up my shop - I couldn't handle saying no to great vintage stuff just because it didn't fit my daughter! 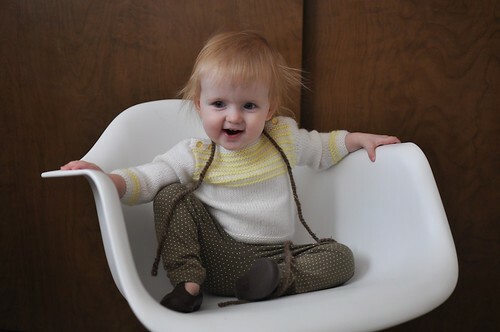 Tayvee's wearing: vintage yellow swiss dot dress, c/o little reader vintage. saltwater sandals, thrifted. sunglasses, white pine boutique. Q: How do you style your daughter? A: Typical days involve leggings paired with simple shirts and sweaters. When I look for vintage clothing for her, I really try to find the simplest pieces. Anyone in my family can tell you that I'm really picky when it comes to what she wears! I also sew her a lot of skirts, and I try to find vintage fabric to use for those. My favorite thing I have found for her lately is a vintage dress with ferris wheels across the bottom. It's awesome, and I secretly wish it was my size (and that I could pull it off). 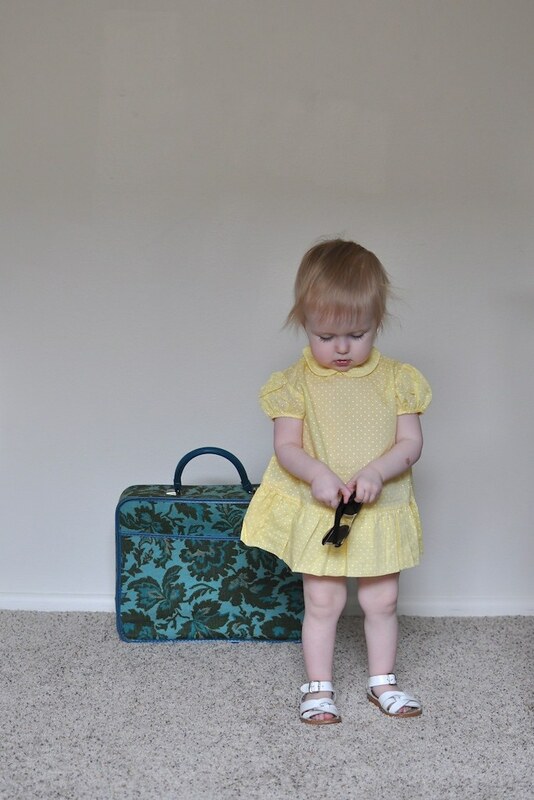 Thank you, Whitney, for sharing your vintage style and photos of you and your ADORABLE daughter! Her hair is beautiful. Oh, and if you ever come across another pair of vintage shoes like the ones you're wearing I wear a vintage 9.5. Ha! 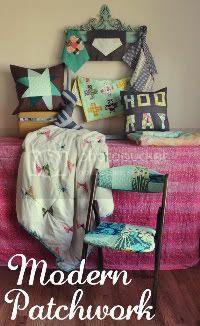 Be sure to stop by Little Reader Vintage and see what treasures she's got for little ones! please visit my blog and say hi! A real 'Effortless chic' look on Whitney - those shoes are so cute and a real bargin! Love her daughters yellow dress too. Love these features. 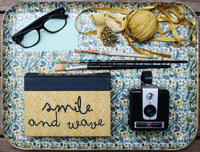 I love hearing how everyone incorporates vintage into their daily style. I'd say Whitney and I look for similar things while in the thrift store and use vintage accessories to spice things up. I'd take those shoes in a size 7 please! yeah. those shoes in a size 6 please! she is so sweet and we have become email friends too. her style is so simple, vintage and so modern all the same time. i wish i could pull off a button down and jeans with the finesse that she has! never mind her shoes...i want her legs! Neither fits me, but I do of course have big plans for them!!! whoa those dresses are superb to say the least. oh my goodness! that dress is ADORABLE. she's a little model. very cute.